But they vow to stick with it regardless. 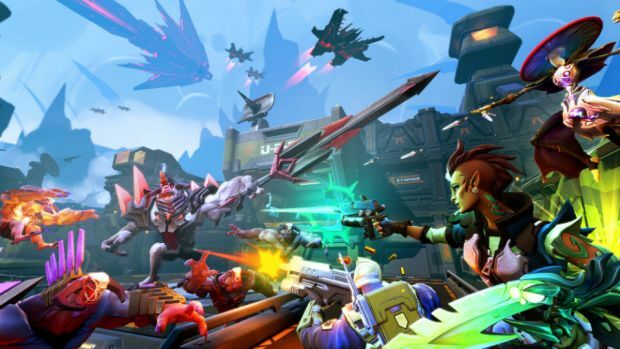 2K and Gearbox’s latest gambit, Battleborn, the hero shooter that was released in May, appears to have failed- in Take-Two’s latest financial earnings report, the publisher (which owns the 2K Games label) has admitted that the game underperformed, and did not live up to expectations. “While the game launched to solid reviews, its performance in the market has been below our expectations,” Take-Two CEO Strauss Zelnick said (via Eurogamer). Of course, what exactly he means by ‘solid’ reviews is very open to interpretation- a look at Metacritic reveals that the PS4 and PC versions of Battleborn are both at a sub-70 Metascore. The Xbox One version ekes out a 71, but it also has the fewest amount of reviews, so a smaller sample size can avoid weighing down the average too much in this case. Nonetheless, Take-Two appear to be committed to the game. “We think there remains an opportunity to grow the audience for this unique experience over time,” Zelnick said, “and 2K will continue to drive engagement and recurrent consumer spending on the title through add-on content and virtual currency. So, it sounds like 2K plan on continuing to push out more content for the game and make it a more appealing prospect for customers current and potential, while also maximizing engagement and revenue per user as well. It’s a good plan overall, and I have to give them kudos for not just ditching the game. Battleborn is out now on Xbox One, PlayStation 4, and PC.